For a really long time (throughout my entire late teens and early twenties in fact!) I never really owned jewellery that I could wear on an everyday basis. I had quite a thing for statement/ dress jewellery for ages, and over the space of a few years of buying it I ended up with an insane collection of the stuff, and so it never crossed my mind to invest in 'proper' jewellery. I am still partial to the odd bit of statement jewellery, it looks pretty and can dress up an outfit or add some colour- however these days my collection has been scaled back a lot and I've definitely come to appreciate nicer jewellery instead. Rather than wearing statement accessories every day, I prefer pieces that are more understated and can be worn with any outfit or for any occasion. 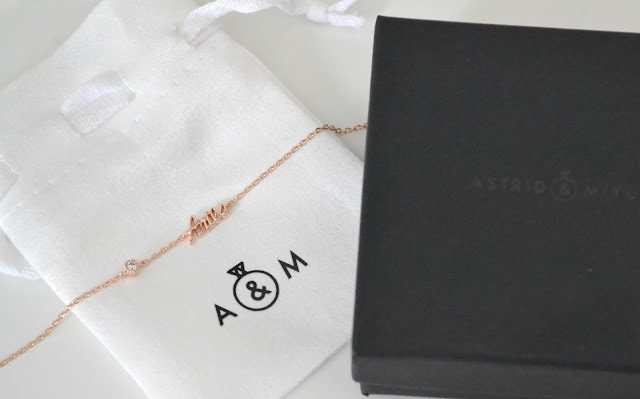 Astrid and Miyu are a brand I've heard loads about on blogs, Instagram and Pinterest and was immediately obsessed with their dainty and unique jewellery. One of my favourite designs of theirs are the horoscope bracelets, and so as you can imagine I've been staring at my wrist constantly since getting my hands on this! I can honestly say everything about this bracelet appeals to me, I think it's absolutely beautiful. From the script font of the horoscope name to the tiny matching birthstone (I'm always a sucker for personalised things!) 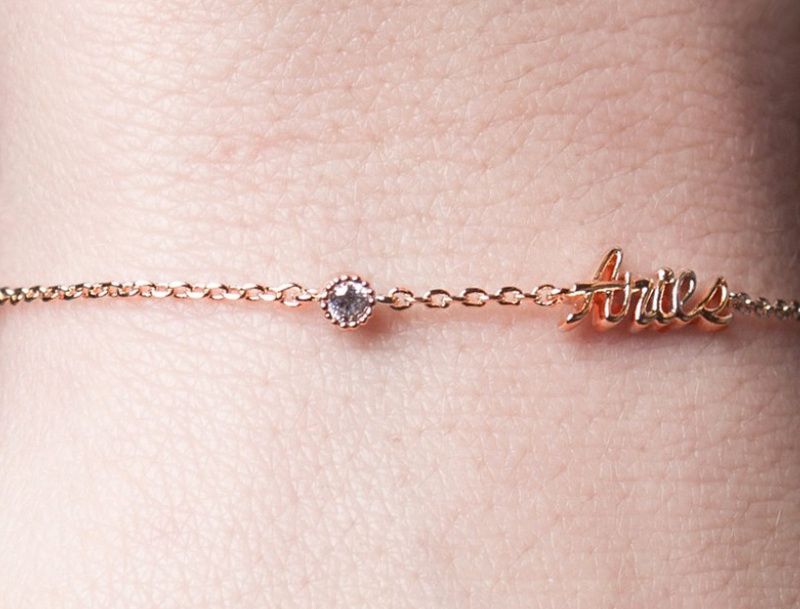 to how dainty and pretty it looks on the wrist. 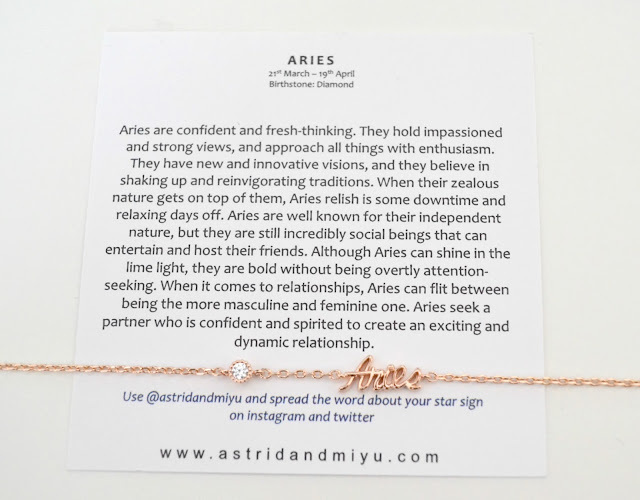 All of the horoscope jewellery comes in three different colours- rose gold, gold and silver which is nice as it makes it even more personal to you. I almost always go for silver jewellery but something about the rose gold of this stood out to me, especially against the colour of the gemstone. It looks lovely layered up with other rose gold bracelets, or simply worn alone. It comes really nicely packaged too, the sturdy black box contains a horoscope card with a cute design on one side and information about the star sign on another, with the bracelet itself coming inside a white dust bag. The whole lot together makes for an amazing gift, especially for a birthday present with it being a horoscope design! When I was looking at this online I have to admit I did have some concerns, however after opening it up and wearing it I now know that I had nothing to worry about. First of all I was a bit worried about how this would look on my wrist, it's such a thin bracelet and I was worried it would look a bit 'lost'. Looking at how it looks on I can say now that it definitely doesn't look lost, you can still clearly see it despite being such a dainty piece. Secondly I was worried with it being such a fine chain that it would break easily, but surprisingly it's a lot stronger than it looks and there have been no issues with it breaking- even with a clutz like me! Finally, with it being gold plated brass I was worried it would quickly tarnish or send my wrist green but again that hasn't happened at all. While you do have to be a bit more careful with it than pure gold or silver, it can still be kept on just as you would with any other jewellery- I simply take mine off before a bath/ shower and am careful not to spray perfume on it. I'd definitely say don't let the fact that it's plated put you off. Astrid and Miyu's horoscope jewellery can be found from Jewel Street which is by far my favourite online jewellery shop (they also have a Twitter/ Facebook). They have a huge selection of products for all price ranges, and everything is nicely laid out which is perfect if like me you like to spend ages browsing through everything! Have you ever shopped at Jewel Street? I love anything Zodiac related, so naturally love this. So feminine as well!